E-10 Concentricity Gage is comprised of three main components for assembly. #1) selection of standard or precison accuracy, #2) selection of main rollers, #3) select an indicator(s) and/or other accessories. There are two classifications calibrated and directly traceable to (N.I.S.T. 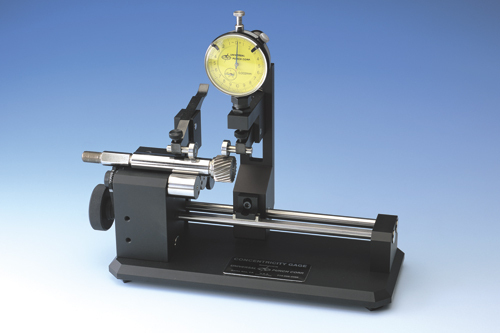 ), Standard Black Gages are guaranteed to be better than ≤ 4µm (.00016") accuracy. Precision Gold Gages are guaranteed better than ≤ 2µm (.00008”) accuracy.